Summer of Gaming and Exploring Gathox! I haven't posted in quite awhile. I've actually been doing a good bit of gaming. I finished grad school and this allowed my school enforced hiatus from gaming to finally come to an end. I spent a good bit of the summer actually playing in several games. I've been in an ongoing 5E Curse of Strahd Campaign that currently has us around 4th level or so. I was able to play in an awesome Labyrinth Lord Mini-Campaign that was loads of fun. I've also taken up the DM mantle after quite a long time and have started running a 5E home-brew campaign. I've even tried my hand at a bit of minis painting (well mostly terrain) and I've had loads of fun. I think I've gamed more this past summer than in the past four years combined! As a result this blog has not been updated in quite awhile. With some store credit, I picked up the Starfinder core rulebook, OMG! that is a huge book! Yikes! The art and layout is impressive, but it is taking me awhile just to read it! That combined with all the 5E gaming I've been doing of late has me finding myself yearning for more OSR goodness in my gaming rotation, Christian's Labyrinth Lord mini-campaign was rules-lite but oh so fun. 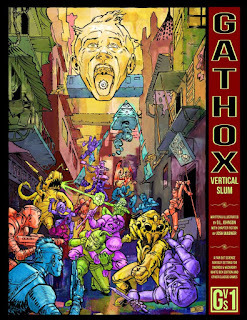 With the OSR in mind, I picked up a recently released product Gathox Vertical Slum. I was able to read a few early drafts of this product and have had a few exchanges with the writer/artist David Lewis Johnson (a great artist by the way!). The PDF (print version is due out any day now) is a fun, imaginative and rather Gonzo setting. Based on the White Box rules, but you should be able to adapt it to most old school rules. You will need a copy of the rules system of your choice to play it, in order to complete character generation. 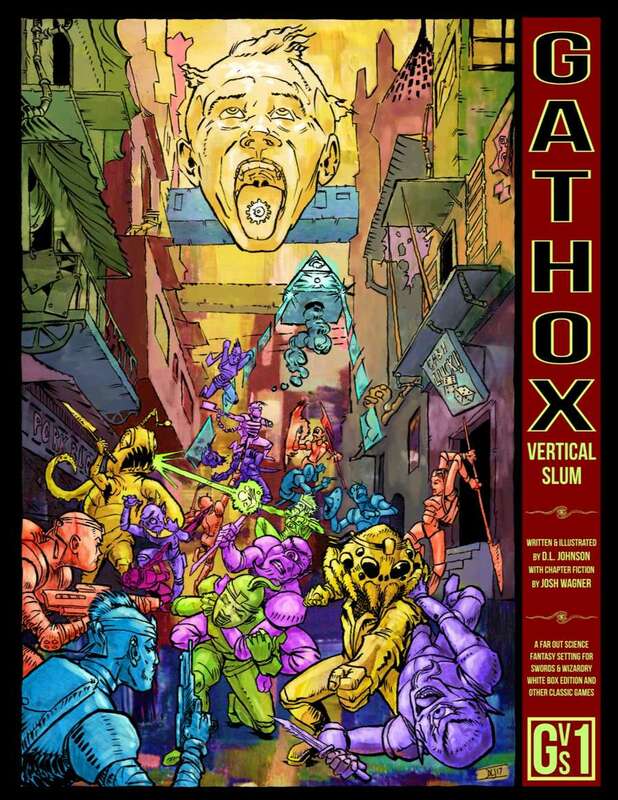 "Welcome to Gathox Vertical Slum, a far out, gonzo science fantasy campaign setting for Swords & Wizardry White Box Edition and other classic tabletop role playing games. * A fully mapped and fleshed out Vertical Slum, stuffed to the gills with greedy factions, hook-laden NPCs, and seedy locations. * A new gangland system for running domain-level games at level 1. * 43 fully illustrated strange and inimical monsters to spring on unsuspecting players. * New classes, skills, ability checks, hirelings, and gear for players to work their will across the mean streets of the Great Spire. * A vertical dungeon introductory adventure to test the skills and resourcefulness of new and seasoned players alike. * Over a hundred lavish interior illustrations by D.L. Johnson. * Five pieces of interconnected chapter fiction contributed by Josh Wagner."